WarpIn ist ein Installationsprogramm zum Installieren und De-Installieren von Software für OS/2 und eComStation. -- Prevent REXX from running in WIC -q and -m modes. handle external archives in WIC -m mode. -- Fix crash in WIC -q mode when package not installed. -- Fix crash in WIC -t mode when using WirexxVarPrompt. -- Correct several options in WIC relating to WirexxShowMessage handling. by converting to system codepage. -- Add "Make Repository" and "New Updates" modes to WIC. -- Fixed LONGFILENAMES package attribute. Bug 949. -- Fixed benign error with XML variables not being used. Bug 1182. -- Fixed error code reporting in several places. executed daemons from locking access to the database. -- Fixed multiple delete attempts in WIC's -d mode. case sensitive handling. Bug 1170. -- WirexxShowMessage() now supports hex. numbers. Bug 1166. -- Added WirexxCancel() function to allow abort of installation from REXX. -- Added WirexxVarPrompt() to allow prompts for variables from REXX. do not now cause errors. Bug 1062. -- "wic -g" caused an "Error 2 writing XML document to disk" error. -- Some icons updated to improve aesthetics. Bug 1056. -- Split bar removed from right hand package pane. Bug 1058. -- Modifying a self-extracting .EXE corrupted it. Bug 1093.
database unreliability on shared memory constrained systems. Bug 1091.
in the script. Bug 1060.
correctly and not scrolling correctly. Bug 1086. -- Script window now not resizable because it didn't update properly. -- Fixed version number. Bug 1140. -- Fixed exception on main thread when installing WarpIN over itself. -- Added support for Codepage 1208 (UTF-8). Bug 1127. -- "wic -l" now displays the date/time of packed files. Bug 1131. -- Allow Ctrl-Ins to copy text to clipboard from Textview controls. contain Rexx scripts. Bug 1045. -- Minor installation bug with test.wis and test.cmd. Bug 1049. -- Documented "wic -g". Bug 1048.
splitting the .INI file information into 64K chunks. Bug 1050. -- Installation progress bar behaved erratically due to fix for bug 948.
only to the default browser. -- Packages containing 0 bytes worth of files caused a "broken package"
error and were not able to be uninstalled. Bug 948.
a directory count of 0 when attempting to delete undeletable files. and run De-executes before deleting INI file entries. Bug 1024. -- Implemented "wic -g" mode to generate an XML CID file from an archive. with the specified URL. Bug 1031.
on mouse driven context menus. Bug 1015. -- Added support for Codepage 1386 (IBM Chinese). -- WarpIN trapped on archives containing files with invalid datestamps. -- Finally fixed issues with installing in the root directory (I hope). The relevant non-working fixes for bug 625 were removed. Bug 925. -- Added a "Yes to All" button to the Delete Newer File dialog. Bug 933.
packages at script processing time. Bug 909.
static references to UCONV.DLL and LIBUNI.DLL. Bug 936.
the file was in a subdirectory didn't delete the temporary directories. -- Support adding packages with no files by specifying NUL as a filename. -- Closing the Archive, View window caused WarpIN to exit. Bug 896. -- Added a FAIL option to the CREATEOBJECT attribute. Bug 893. -- Updated documentation for the EXECUTE and DEEXECUTE attribues. Bug 894. -- Fixed a minor bug in the install script processing. -- WIC now defaults to overwriting newer files rather than aborting. the .XCD file. Bug 851. -- Added an Unlock All option to the "Locked File" dialog. Bug 802.
to fix bug 718 in the previous release. Bugs 836 and 718. -- "wic -t" used to exit silently if it couldn't read the script file. -- Correct $(x) macros to remove trailing '\' when at root directory level. -- Confirmation dialog boxes now have a tasklist entry. Bug 712.
making it hard to read. Bug 727. -- README tag fails to extract files with special characters in the name. null key was specified. Bug 833.
poor package attribute parsing also. Bug 718. -- Kill splash screen earlier in database mode to correct focus problem. -- Packages are now uninstalled in reverse order. -- Fixed crashes in WicPM when doing "stupid" and "not so stupid" things. Also removed redundant and unimplemented menu items. -- Fixed cosmetic problems with the split view in database mode. Bug 228.
other packages being installed caused the whole installation to fail. Users are now able to deselect any dependent packages. created pointless backups (and sometimes needless prompts to reboot). package's target directory. Bug 667.
needing to set BEGINLIBPATH first. occurrence on a line. Bug 647. CLEARPROFILE attribute instead of "USER\..." and "SYSTEM\...". and refused to query the database. -- Added documentation for "wic -t" and automation environment variables. -- WIC was using '.' in some other places for the thousands separator. Now properly uses the NLS information. -- "wic -i" can now de-install packages. processes, unlock and overwrite files. ignored. Packages are now deleted properly under these circumstances. -- Fix endless loop bug attempting to unlock and delete open files. -- Fix for bug 626 from V1.0.5 is removed as it causes problems. -- DEEXECUTES were not being run in the package's installation directory. -- The Drive Information dialog is now only shown when needed. which caused major problems if the files were on a network drive. due to network resource exhaustion. Bug 636.
than approx. 42MB due to numeric overflow. Bug 637.
since the archive updating was fixed. Bug 638.
and refused to verify the script. Bug 645.
the DEEXECUTE attribute. Bug 434.
directory set to that of the relevant executable. Bug 626.
can generate your .WPI file in stages rather than all at once. Bug 169. -- Improved installation script attribute parsing. to get lost. Bug 634. -- Reimplemented the "warpin -i" option from 1.0.3 which was missing. -- Cosmetic problems with package deselection and deletion. to work without error. Bug 633. -- Default for option "Show warning if scripts have active REXX code"
-- WarpIN WPS objects are created in "Update" mode rather than "Replace"
-- Added '-d' delete mode to WIC and enabled archive updating modes. use the default STUB.EXE as the stub file. -- Trapped on Warp 3. -- Got an "M" in Install path when using Back/Next buttons. Bug 317. -- WIC was using incorrect files when using U+ option. if WarpIN wasn't previously installed. -- Remove trailing ; from $(env) tags. Bug 464. -- Allow ' characters to delimit attributes in tags, meaning "
characters are now usable inside the attribute. Bug 461. -- Fixed some cosmetic problems, typos. etc. Bug 356. -- Fixed CONFIG.SYS Ctrl-Z problem. ignored when no modifier was used. 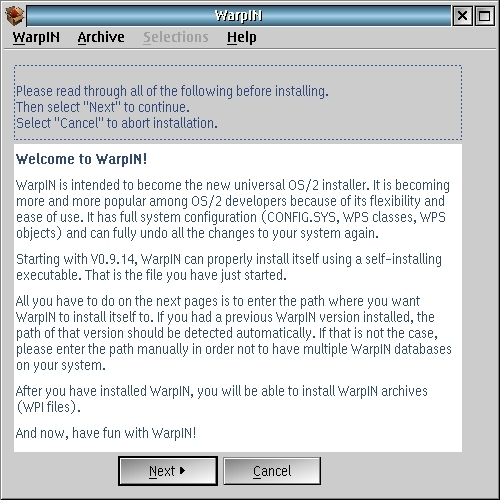 -- WarpIN now installs itself into its own database on initial install. line option for eCS installation. part of the distribution. Fixed. -- Selecting "WarpIN" -> "Default directories"
version while I was at it. contained macros referencing other packages. Beautified split view in database a little. if its directory contained non-ASCII characters. stricmp as well now, so that should work better. which didn't really help either. Fixed. Time for new features again. everything WARPIN.EXE can do. Type "wic -hi"
to get an introduction for now. it can easily be killed from XCenter. only displayed to the user. deinstall broke with some earlier version. in the config class hierarchy. scripts without breaking binary compatibility. mostly on exit. This one was very hard to find. on resolutions other than 1024x768. taken as part of the filename. Fixed. failed, which is why the "process codepage"
detection did not work. Fixed. set in the "Preferences" dialog. Fixed. example, Martin Lafaix' widget libraries. with Martin Lafaix' widget libraries. -- First attempt at supporting DBCS codepages. be sure whether this actually works. checkbox containers now for future extensions. -- Splash dialog would never disappear in install mode. -- Removed the stupid "list is not in SHADOW mode"
debug message that appeared on deinstall. a real problem when many packages were installed. messages than just "No sufficient WarpIN found". on deinstall left duplicate ';' chars in the line. appended after that marker, being ignored by OS/2. for telling me about this problem. preparation for future CID support. nuked on every install. Fixed. variable. Fixed; the value first entered is now stored. -- Fixed crashes with PWICQ.WPI. Workshop, September 17 to 21, 2001, Heidelberg, Germany. -- Added "script test mode" (-t option) to WIC.EXE. for forced recreation of WPS objects and such. install mode didn't update the drives info window. -- Added more data to archives display in "Archives"
takes almost half the time. provides C++ type safety through the list template. for limited RTTI and run-time object management. mostly for stub support to make stub.exe smaller. This required more changes to the back-end. -- Yuri Dario made some changes for VAC 3.6.5.
meaningful error codes to the back-end. versions to fail on the archive. This only applies if you use the wic -u option. -- WarpIN 0.9.13 can open all WPI files (WPI rev. 0.9.13 or higher to install the WPI. Stub support is otherwise still not documented. Documentation will follow in a later release. were required for certain Odin features. so that several packages can be deleted at once. reports if user attempts to remove required packages. are violated if user absolutely wants this. to read with longer messages at times. after a gap in the available drive letters. Fixed. system for minutes, so this was added. package. I guess this broke with V0.9.9; fixed. found with certain space combinations. to incomplete trap logs. Added. -- WIZILLA.EXE was broken. Fixed. only giving a warning once. Added a couple of urgent fixes that were missing in V0.9.9. never failed on my system, I never got those errors. -- readme.txt wasn't up to date. Updated. and bugfixes. Hope this didn't break anything else. -- wic -x finally works with file masks. -- wic -a failed with files in root directories. Fixed. can be changed in the "Preferences" dialog. to be run during de-install. -- EXECUTE sometimes didn't work with parameters. Fixed. if the numer was in quotes. Fixed. target path ("? :\") didn't work. Fixed. (new "Archive" menu -> "View"). the same application name, but different authors. Fixed. the root directory of a drive. Fixed. the file should still be deleted. that dir didn't exist yet. Fixed. -- Various optimizations all over the place. perfect... this needs a redesign. package was already installed. Fixed. -- Further optimized internal string routines. -- WIC.EXE crashed packing 0-byte files. Hopefully fixed. tag macro resolution. See WPI_PROG.INF for details. because apparently this crashed on some systems. faster in general, especially with script parsing. WARPIN_DISPLAYPAGES=NO with Odin, and it worked. working again. Some minor improvements were made as well. -- WIC.EXE broke with V0.9.4. Fixed. WarpIN executables now use a shared library (WPIRTL.DLL). this implies that the executables need to find this DLL. -- WarpIN forgot to report network drives in "Drives Info". -- Removing INI (profile) entries works now. which deleted wrong lines in CONFIG.SYS. -- Added more help panels. -- Added more context menus to database view. -- Fixed code to compile with EMX again. -- WIC now skips 0-byte files. -- WarpIN now runs even if the WPS is not up. -- Changed WARPIN VERSION= to three-part versioning. script environment variables. See WPI_PROG.INF. -- VARPROMPT didn't display text right. Fixed. -- Fixed EXECUTE bugs (thanks Yuri Dario). -- EXECUTE can now have several modifiers. -- Added dependency checks to deinstall from database. can be selected individually now. -- KILLPROCESS didn't work on de-install. Fixed. -- Deinstall can unlock files now. are not empty, a more meaningful message is displayed. -- Drive info window stopped after first invalid drive. Fixed. -- Fixed exception handlers, which broke with V0.9.3 again. -- Great speedup with HTML viewer. -- Added REXX support documentation to WPI_PROG.INF. -- Added FORMAT=HTML and FORMAT=PLAIN to <README>. -- XTextView control had serious problems with scroll bars. Fixed. Also added lots more features. -- Added more package dependency checks. -- Macros in target paths never worked, especially "? :\"
-- <PCK CREATEOBJECT> didn't work with REPLACE. Fixed. -- <PCK EXECUTE> didn't work right. Fixed. -- Added <PCK EXTERNAL REQUIRED>. -- Fixed a few memory leaks in BSString class. -- Added more error checking in various places. -- VARPROMPT window crashed if nothing was entered. Fixed. -- Tabs in scrips caused errors. Fixed. -- Added readme shadow to WarpIN install objects. -- Checkboxes weren't always set right on Configure page. Fixed. with certain strange stack frames. Fixed. -- SYM file parsing only worked on Warp 4. Fixed, I hope. -- Switched helpers to create helpers.lib now for easier linking. Mostly bugfixes, plus REXX support, plus new tags. -- Script codepage support added. -- Free space on drive wasn't displayed right if > 4GB. -- Finally displaying package descriptions as tooltips. only one package can be selected. -- Added database "configuration" view. -- Sped up database display. -- Added tab key support to database windows. now using virtual methods, which works much better. multiple packages at once. Fixed. -- "Exit" menu item didn't work. Fixed. exception handlers parse SYM files right. This is both a "lotsa-new-features" and a bugfix release. we check whether dependencies are met. extremely extensive. I'd be grateful for more feedback. -- CONFIGSYS attribute UNIQUE flag support improved. -- EXECUTE attribute is now supported. (although deinstallation doesn't work yet). XTextView control for viewing text. extent, should it become corrupt. in the boot drive. Fixed. -- Script parsing errors always had wrong line numbers. Reworked that, I hope it's better now. -- REPLACECLASS wasn't stored in the database. Fixed that. -- Fixed some memory leaks and other heap problems. to subdirectories and recursively adding files. recompiles and speed up compilation also. size by about 100 KB doing this. an archive have already been installed. -- Rewrote "add/remove" mode completely. -- Lots of other user interface enhancements. -- Entry field on cnr page was limited to some 30 characters. Fixed. an incompatible archive format, but compresses faster and better. -- DLL/EXE files can now be unlocked if in use. -- GROUP tags are working again. -- WARPIN and TITLE tags are working. -- Added EXPANDED attribute to GROUP tag. -- Database was missing install date and time. Added that. -- PMWIC added to source code. -- Added directory recursion to WIC.EXE. -- There are now two INFs: one for the user, one for the programmer. This means that de-installing packages should be working now. Check the PCK tag reference in WPI_PROG.INF for details. -- Better "File exists" dialog. -- Multiple packages are now supported. -- Added environment variable support for CID installation. a sophisticated exception handler too. -- There is readable documentation in INF format now. PLEASE READ IT before asking any questions. Lost track of them, sorry.